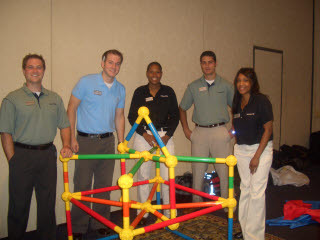 “We were intrigued by its potential as a teambuilding training aid. TOOBEEZ clearly meets the tough guidelines imposed by facilitators of experiential learning. We were amazed by its solid construction and simplicity. Peter Grazier - President, Teambuilding, Inc.
"The kids "ATE IT UP", as the saying goes! Our kids are a mixed population from 12-17 year olds who are severely emotionally challenged, and their diagnoses can be greatly varied. Our goal is to make school here as positive and successful an experience that we possibly can. We split the kids into two groups. I stood a large mat on its side, so that they couldn't see each other's ideas. I simply asked them to "build a house". They INSTANTLY kicked into cooperation mode. They were communicating ideas, you could almost hear their minds working. Everybody is using them in a different way, because they are 100% open ended. A Hospital in Wisconsin uses them for Therapy and teambuilding games. They put on a demonstration for the state association of special needs children. We then received quite a bit of purchase orders from elementary schools in this state. A camp in Texas uses them with their kids. The leader brought them to a local elementary school for field day activities, and the next thing we saw was a purchase order for the entire school district. A local Red Cross office bought some to create small tunnels. They teach kids how to get out of a building fire by crawling. A Church in Texas uses them during Sunday School. They built Noah’s Ark while telling the story. A wedding planner purchased several sets to keep a group of kids busy at a wedding. A camp bought several boxes to make portable cubicles for their check-in process.They also use them for teambuilding games or free play. One of our very first customers uses them for dog agility training. A large consulting firm in NY City bought 12 boxes for the Bring your Daughter to work day. They conducted team activities in the morning and had free play in the afternoon. A jewelry store bought several boxes for a local festival the town was having. The kids played in front of the store...while the parents were held somewhat captive. Increase jewelry sales with a captive audience? Many times people who purchased a set for Christmas, came back and bought more next year. A Universities Corporate Education Department uses them for Executive Teambuilding. They build very large bridges that take many hours to complete. A teambuilding coach bought 8 boxes to use with his clients, and as a tool to win new business. This is not the same old game show or scavenger hunt. A children’s museum uses them for their annual construction zone "play day".They also sell them in the gift shop. A retail clothing store chain (they do not sell our products) bought some for their creative window displays. At a recent tradeshow two elementary school teachers came by our booth. They said they bought several boxes when we first launched in 2003. They use the product in their school as a privilege...for good behavior. They love it! A Mongolian BBQ restaurant in Michigan bought a set for teambuilding activities with the staff. An Optometrist office in California bought a set for teambuilding activities. A mom in Canada bought a set for family teambuilding games. This inspired me to create another book. A toy store created a unique structure in their front window. It not only stopped traffic, they sold many units…and still do today. A steel drum (musical instrument) company is considering using Toobeez as a stand. This company likes the way the product can used for different heights. We are considering a special package for this possible partnership. We use Toobeez for our shelving in our office. We are considering creating a metal version of our product. This could revolutionize the scaffolding industry. Think about the man hours used during the set up and dismantle process when using screwdrivers or socket wrenches. A high school uses them for team building and to display banners during football games.